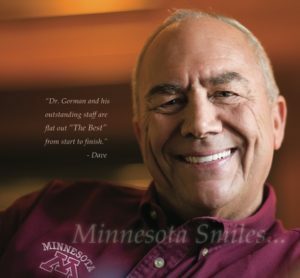 Dave Metzen, Board Development and Leadership Speaker, is one of our long-time wonderful patients here at the Gorman Center for Fine Dentistry, has reached the highest levels of education in the state of Minnesota. As a motivational speaker for boards, business leaders, executives and educators, Dave inspires others by teaching the art of leadership, coaching and mentoring with their employees, partners and customers. In this article he shares the importance of a confident smile and handshake. Dave was also a former team captain the University of Minnesota Gopher hockey team and has earned both his Masters and Doctorate in education from the University of Minnesota, served on the Regents Board at the University of Minnesota, and was the Superintendent for 18 years of the South St. Paul School District after he was a curriculum director, teacher, and principal as well. Dave is also the Commissioner of Higher Education for the state of Minnesota. Well known for his genuine warmth and humor, he shares his long and diverse career experiences to motivate others. One component Dave talks about is the power of a handshake, which coincides with the importance of a smile. He and Dr. Steve Gorman agree that first impressions truly do rely on these factors and can end up being the difference maker when it comes to important situations. You only get one chance to make a good first impression. The key to making that impression last is to give a confident smile, make eye contact and give a firm handshake. These three things are essential if you want that first impression to have a positive impact,” said Dave Metzen, Board Development and Leadership Speaker. Have you ever heard the phrase that “smiles are infectious?” It is true…whether you are meeting someone for the first time or you have had many encounters with this person, it is important to give a confident smile when you see them. According to a TEDTalk video by Ron Guttman entitled, “The Hidden Power of a Smile,” a smile can change the moods of both the smile-er and the smile-ee. The smile-receiver is instantly put at ease while the smile-giver’s endorphins get a boost. It’s a win-win! Along with flashing that beautiful smile it’s also important to give a firm handshake while maintaining eye contact. According to an article in Forbes, a Fortune 500 CEO once said that when he had to choose between two candidates with similar qualifications, he gave the position to the candidate with the better handshake. Therefore, the next time you meet someone for the first time, take the initiative to hold out your hand and give them a handshake. Use a firm grip, and as you are shaking their hand, look them in the eye, smile, and don’t focus on the handshake itself. Rather, focus on introducing yourself to the person across from you. You never know what type of relationship may stem from that, and it all begins with a simple smile and proper handshake.